This book analyses the rapidly increasing role of African states, leaders and other political actors in international politics in the 21st Century. 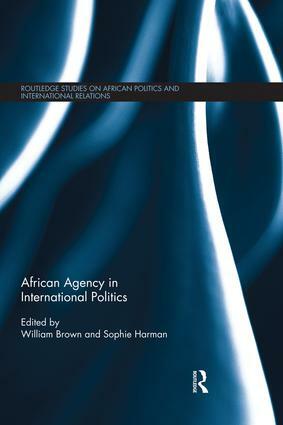 In contrast to the conventional approach of studying how external actors impacted on Africa’s international relations, this book seeks to open up a new approach, focusing on the impact of African political actors on international politics. It does this by analysing African agency – the degree to which African political actors have room to manoeuvre within the international system and exert influence internationally, and the uses they make of that room for manoeuvre. Bringing together leading scholars from Africa and Europe to explore the role and conception of African Agency, this book addresses a wide range of issues, from relations with western and non-western donors, Africa’s role in the UN and World Trade Organisation, negotiations over climate change, trade agreements with the European Union, regional diplomatic strategies, the character and extent of African state agency, and agency within corporate social responsibility initiatives. African Agency in International Politics will be of interest to scholars and students of Africa’s international relations, African politics, development, geography, diplomacy, trade, the environment, political science and security studies.